India has had an image makeover over the last two decades and rightly so. The nation, once known more for its mystical traditions and depressing poverty, has gradually shed the not too flattering sobriquets of the past. In the world’s eyes now, the country is an emerging economic power. A land where millions have emerged from poverty in a relatively short span of time, where the economic fortunes of several more millions are set to transform for the better in the years to come. Now, most famous as the leading destination for information technology and other services outsourcing, India has reaped the benefits of globalization more than most other countries. A stable democracy where the rule of law is respected, India has become one of the most favored destinations for global investment capital. The South Asian country, which was a British colony for close to two centuries, gained independence two years after World War II. Jawaharlal Nehru, its first Prime Minister, ushered in democracy on the eve of August 15, 1947 with these words: “At the stroke of the midnight hour, when the world sleeps, India will awake to life and freedom.” It took more than four decades since that day for the country to start believing in itself and it is only now that India has truly awakened to life. Today, the nation has earned its rightful place as a significant player in the global economy and a political and military force to reckon with. India owes its name to Indus, a majestic river that meanders through its northern parts before wandering over to Pakistan and finally flowing into the Arabian Sea. On its banks, around 4,500 years ago, flourished one of the world’s oldest and greatest civilizations. India’s story of evolution began here. In fact, the genesis of the entire Indian Subcontinent — the South Asian Peninsula that includes modern-day India, Pakistan, and other countries — lies in the Indus Valley Civilization. All countries of the subcontinent share a common history of dynastic rules, such as those of the Mauryas, Guptas, and Mughals, as well as the shared suffering of loot and plunder by invaders like the Greeks, Persians, Turks, and Huns. In the 18th Century, the British came to the subcontinent to trade and exploit the deep political divisions among the several hundred minor kingdoms to gain political control of the entire country. They eventually dethroned the weak Mughal ruler and created the Indian Empire, which included today’s India, Pakistan, and Bangladesh. That rule lasted nearly two centuries. British rule battered India, both socially and economically. However, it was only at the turn of the 20th Century that a concerted freedom struggle gained momentum throughout the country under the leadership of M.K. Gandhi, the world’s most enduring symbol of peace and non-violence. Outmaneuvered by Gandhi’s non-violent resistance movement, the British eventually left the subcontinent. Their last political act of dividing the sub-continent into two nations – India, a secular country with a largely Hindu population, and Pakistan, a Muslim state – shadows the political climate in the region even today. The partition triggered one of the largest mass displacements in human history. Hundreds of thousands of Muslims fled India to Pakistan and an equal number of Hindus and Sikhs migrated from Pakistan to India. The exodus was marked by riots and bloodshed, which took their toll on the economies of both the infant nations. Despite Pakistan’s disapproval, India’s slice of the pie included Kashmir, a state with a largely Muslim population, a move which increased the bitterness of the separation. To this day, this remains a sore point between the two countries, which have fought as many as three wars over the issue. The state of Jammu and Kashmir remains troubled by terrorist activities of separatists, including Islamic fundamentalists, who want the region to be either merged with Pakistan or given the status of a separate nation. Since independence, India has been a democracy, barring a brief period of constitutional emergency during the 1970s. The country is a federal republic, a union of 28 states and seven federally administered territories. It has a parliamentary form of government based on the British Westminster system, where many parties contest elections to send their representatives to the nation’s legislature. The president is the formal but nominal head of the state, while the prime minister runs the country with the support of a council of ministers. 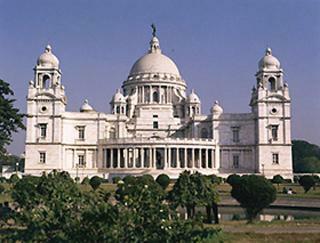 The Victoria Memorial in Kolkata, India was completed in 1921. Queen Victoria, the “Empress of India”, is associated with Britain’s great industrial revolution and economic progress. Under her reign, the British Empire flourished. The practice of democracy in India can be very raucous, with several national and regional parties vying for political power. Corruption is still widespread and the influence of businesses and other interest groups on public policy remain strong. Nevertheless, in recent elections voters have tended to reward good governance, transparency and leadership. Since the 1990s, multi-party coalition governments have been the norm in the country as regional political parties have gained political strength at the cost of national parties. It became imperative for the two major national parties to attract regional partners to gain a majority in the federal parliament and form a government. Though political convenience dictates many of these alliances, the federal government has been relatively stable since the late nineties. The increasingly violent agitation by left-wing extremist guerillas to gain political power in several regions has become the most serious internal threat to the Indian state. These militant groups exploit and thrive on the social, economic and political disempowerment of the poor in rural areas. The rigid social caste structures that kept out the majority of the population from economic and social opportunities for centuries remain mostly undisturbed even today, especially in the poorer regions. The failure of the federal and state governments to address the developmental backwardness of these regions and substandard governance have festered the problem. Alarmed by a series of militant attacks which have claimed hundreds of lives, the federal government has initiated an intense campaign to root out such guerilla groups. Vibrant hues of Indian culture. 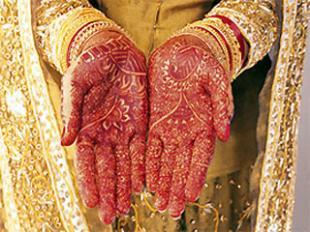 As part of the Indian wedding ritual, the bride’s hands are intricately decorated with Mehendi or henna dye. Four world religions – Hinduism, Buddhism, Jainism, and Sikhism – originated here. Others like Zoroastrianism, Judaism, Islam, and Christianity touched the nation’s shores in the first millennium A.D. More than 80% of Indians are Hindus, while nearly 15% are Muslims. The rest are Christians, Buddhists, Jains, Sikhs, Parsis, and Jews. An important aspect of India’s social structure is its caste system. Centuries ago, the pecking order in Indian society was based on the importance of a person’s work. People who belong to the highest caste performed the socially most important function, which was priestly work. They were followed by soldiers, traders and farmers, and craftsmen in that order. A large group of people was even below the lowest rung of the caste system and was excluded from the main society as ‘untouchables’. Though decades of affirmative action and policies have lightened the divisions somewhat, the caste structure continues, mostly among Hindus, even today. Though the work allocated to a particular caste is no longer exclusive, caste plays an important role in the country’s society and politics. Indians love their dance and music. Some of the country’s popular dance forms are Bharatnatyam, Kuchipudi, Kathakali, Odissi, Kathak, Mohiniattam, Bihu, and Bhangra. The nation patronizes two schools of classical music — Carnatic and Hindustani. Most of these art forms have evolved over several centuries and have detailed structures and rules for performance. Patronage by the royal families of the smaller kingdoms has facilitated the development of regional dance and music forms in the past. Food has always been an intrinsic part of the ‘Indian’ experience. Indian food, like most things Indian, varies widely from one region to another. But characteristically, Indian cuisine has many textures, spicy fragrances, and myriad colors. The food even looks as good as it smells, though the heady aroma and flavors of Indian curries may intimidate the uninitiated. An Indian’s traditional attire varies from state to state. But one outfit that is truly Pan India is the Saree. Women from almost all parts of India wrap around this six yards of splendor in styles that are distinct to specific regions. The country celebrates as many major festivals as there are months in a year. The minor ones are just too many to count. Some of the learning and practices from India’s traditions and heritage have found acceptance beyond its shores. Indian religious and cultural influences are evident in the religious traditions and art of several South-East Asian cultures. The ancient Indian medicinal system of ayurveda is gaining followers for the holistic approach to healthy living. But the most popular of all Indian practices must be yoga, the meditative system which now has millions of followers across the world. Unfortunately, diversity is not just the defining quality of India’s culture and traditions. It is also the distinctive feature of the country’s woes, ranging from inter-religion, inter-caste, and inter-state conflicts to gender bias. Social and ethnic traditions have led to the suppression of individual freedoms and abhorrent practices like child marriage, girl-child infanticide and feticide. Two centuries of colonialism crippled the Indian economy. According to Cambridge historian Angus Maddison, India’s share of world income stood at a paltry 3.8% in 1952 compared to a mammoth 22.6% in 1700. After independence, the country embraced socialism, with the government maintaining strict control over foreign trade, the private sector, and foreign investment. Attracted by the apparent success of the Soviet Union, first Prime Minister Nehru envisaged a central planned economy that laid emphasis on building state-controlled capital and technology-intensive industries as well as subsidized manual, low-skill sectors. This politico-economic system protected domestic industries but curtailed the country’s growth rate and affected the quality of output. Besides, bureaucracy and red tape held sway. In fact, the period from independence until India’s economic reforms in the early 1990s is called ‘License Raj’ or Rule of the License because entrepreneurs had to acquire a license or government permission to expand capacity, start new facilities, lay off workers, shut down enterprises, and just about everything else. The country’s average annual growth rate of around 3% before the 1990s was woefully insufficient to sustain the world’s second largest population and alleviate extreme poverty. 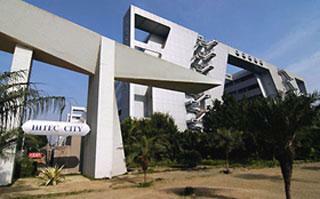 The Hyderabad Information Technology Engineering Consultancy City (HITEC City), a shining example of the burgeoning Indian software and outsourcing industry, is a state-of-the-art technology township. To finance growth and pay for subsidies and other entitlements, the Indian government borrowed heavily. In the beginning of the 90s, the collapse of the Soviet Union, which was India’s major trading partner, and the outbreak of the Gulf War triggered a balance of payments crisis for the country. Its foreign exchange reserves were barely adequate to fund the democracy’s import requirements for two to three weeks, and inflation was high. The Government of India had no choice but to borrow from the IMF and World Bank, on the condition that the government would clean up the fiscal mess and open up to international trade. The reforms initiated by then Finance Minister Manmohan Singh, who is now Prime Minister, are now seen as a watershed in India’s modern history as they sparked the resurgence that eventually made India the economic power it is today. These reforms did away with the regulations that hindered trade and investment as well as purged the system of quotas and tariffs, which had restricted trade. The deregulation of industries attracted private investors who were allowed to raise funds from domestic and overseas capital markets. 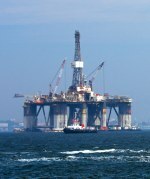 Several of the state-controlled enterprises have been privatized since then, though the process has been rather slow. India’s economy has expanded at an average annual rate of nearly 8% since the reforms were initiated in 1992, an achievement bettered only by China during this period. The average income growth has also kept pace, transforming the country to one of the largest and more attractive consumer markets in the world. The country now draws tens of billions of dollars every year in foreign industrial investments, and portfolio investment inflows are also equally impressive. Unlike most other emerging economies, the services sector dominates India’s economy with a majority share of output. Contrary to global perception, the outsourcing industry has only a minor share in the Indian services industry, below domestic trade, financial services, telecommunications and other business services. The Indian telecommunications market , the fastest growing major market in the world, deserves special mention. Domestic consumption and investment account for the bulk of the economic activity in India, another feature which sets the country apart from several of its emerging economy peers. 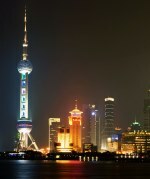 Since the economic liberalization, industry has also seen significant growth on rising domestic and overseas demand. Most industrial sectors are now open to foreign investments, though rigid labor laws remain a hindrance. The country has successfully leveraged its low-cost engineering skills and labor to build a reputation in the manufacture of select products, like small cars. The continued improvement in industrial infrastructure will likely help sustain the growth momentum in manufacturing. India currently imports nearly two-thirds of its energy requirements as economic growth has pushed up demand. The substantial increase in refining capacity in recent years has helped the country emerge as an exporter of refined petroleum products. Coal is the primary fuel for electricity generation, but natural gas from the country’s eastern coast will feed several of the new power plants that are being built. India also has adequate reserves of iron ore which is encouraging steelmakers to set up large steel plants. Though agriculture is the smallest of the three primary sectors, the vast majority of the rural population in India is still dependent on farming and related activities. Because of the large population in rural areas, average farm holdings are very small, which restricts the benefits of economies of scale. The farm sector in India is still heavily regulated and private investments are discouraged. The government actively intervenes in the sector by providing subsidized seeds, fertilizer and electricity to the farmers and buying farm produce from them at assured prices. As most of the financial resources are spent on subsidies, which promotes inefficiency and low productivity, public investment in irrigation and other infrastructure has been low. Unlike China, which has successfully redeployed the surplus farm laborers to manufacturing, India is yet to find a sustainable solution to rural unemployment and underemployment. The Bombay Stock Exchange is the oldest stock exchange in Asia. 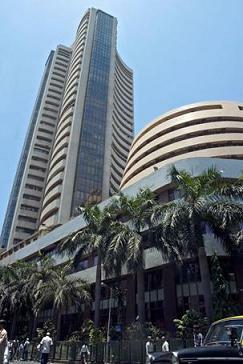 Mumbai, earlier Bombay, the financial capital of the country, hosts two of the busiest stock exchanges in the region. Among the large economies, India has been one of the least affected by the 2008 global financial crisis and the recession that followed, with the stimulus measures implemented by the country relatively small. Economic growth rates did decline for several quarters, but not as much as in most other countries and a domestic recession was no more than a remote possibility. The relatively better structural balance of the Indian economy, dominated by domestic consumption, deflected the collateral damage from the collapse of the global financial markets and the steep fall in global trade volumes. More importantly, some of the programs initiated by the Indian government even before the crisis inadvertently proved to be the most effective stimulus measures. The most significant of the nationwide programs, which helped sustain domestic demand in India, was a federal initiative to provide temporary employment to the most economically distressed in rural areas. The program offered assured work to adult members in every poor rural family for a minimum of 100 days a year. Though it was plagued by poor implementation and allegations of widespread corruption in its early days, the program has since been judged a moderate success, which is significant in a country where government initiatives have poor track records. The program, considered the world’s biggest public works project, now covers more than 45 million households all over the country at an annual budget of nearly $9 billion. In early 2008, the federal government also paid off the nearly $15 billion debt owed by more than 36 million small farmers to commercial banks. This initiative was designed to offer financial support to farmers who were distressed by low farm produce prices, and repeated droughts in several parts of the country. In the short-term, the program added substantially to the cash available to rural consumers, which supported domestic demand. While these programs have lifted income levels in rural areas, they may lead to some undesirable consequences in the long-term. Wage rates have moved up appreciably in several regions after the rural jobs scheme was launched and there are reports of labor shortages, especially for farms and small businesses. The program has become an entitlement and future governments may find it politically desirable to keep expanding its scope and scale, which will adversely affect the government’s fiscal balance. In the future, there could also be increased political pressure from farmers and other groups for periodic debt write-offs, adding to government spending. Until recently, most visitors to India would have several stories to tell about the horrors that await travelers along its roads. From humans and animals jostling for space with vehicles on crowded city roads to the death-defying escapades of truck drivers on narrow highways, the stories were an important part of the India experience for many tourists. But they may soon become tales from a distant past as the road network in India has improved dramatically in recent years. While the condition of roads in several parts of the country, especially in rural areas, remains poor, the major highways are an entirely different picture. The National Highway Development Program launched in the year 2000 is often described as the most significant government initiative since the economic reforms in the early nineties. Under the program, more than 20,000 miles of highways have been upgraded or are currently being developed. Over the next decade, another 20,000 miles of highways will be upgraded and more than 10,000 miles of new expressways will be built. The automobile industry in the country has seen the fastest growth in recent years, as the upgraded road network has lifted demand for vehicles. Developing public transport networks in large cities is critical, especially in countries like India where the demand for public transport is so high because of low private vehicle ownership. Though the road networks within large cities have been widened and elevated roads constructed to ease traffic congestion, the cities still struggle to absorb the steady increase in the number of vehicles. Building large capacity public transport networks maybe the only long-term solution. Anyone who has travelled in one of the impossibly overcrowded city trains in Mumbai will realize how vital such transport links are to the city’s economy. For many years, the public transit systems of major Indian cities were mostly run down like the trains in Mumbai, severely inadequate and even dangerous for passengers. However, like the country’s highways, India’s urban transport is also getting a major makeover. The capital Delhi now boasts of a world class metro railway, which now extends nearly 120 miles and carries more than 2 million passengers a day. Similar networks are sprouting up in the southern cities of Bangalore and Chennai and the harried train users in the city of Mumbai will also get their modern metro rail system shortly. A series of corruption scandals involving high public officials has been exposed recently, which has brought to light the disturbing level of corruption and poor government accountability in India. The lead up to the 2010 Commonwealth Games, the biggest sporting event hosted by the country so far, was marred by stadia and other facilities which remained incomplete until the very last moment. The Games were eventually staged successfully and to wide acclaim, but only after desperate efforts by the federal government. Now, the senior officials of the Games organizing committee have been accused of siphoning of funds and nepotism in awarding contracts. 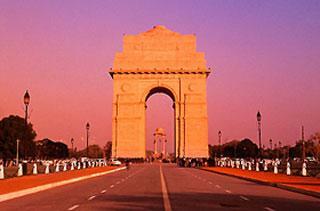 As the sun rises over the India Gate in Delhi, nearly seventeen million people in the city awaken to the promise of a new dawn. To reach its potential, India must leverage the brainpower, work ethic and energy of its large population to drive improvements in process and infrastructure. The Commonwealth Games scandal pales in comparison to the controversy concerning the granting of telecom licenses over the last decade. The pricing of spectrum allocated to communication services providers in India was, until recently, not based on competitive auctions. For the licenses, the operators were charged fixed prices, which were not revised periodically based on market demand. As the Indian telecom sector achieved the fastest growth globally, the inherent value of the licenses increased several fold. It is now alleged that the ministers and other government officials deliberately kept the fixed price licensing policy to receive financial kickbacks. The country’s public audit office estimates that this policy caused revenue losses running into tens of billions of dollars to the government. A former federal minister, senior officials, and several businessmen have been arrested as part of the investigations by the federal agencies. 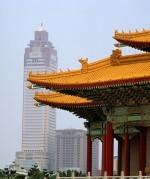 However, the scandals and controversies have not dented the country’s economic growth momentum. Powered by strong growth in domestic consumption, the Indian economy is now growing nearly as fast as it did before the global recession. Favorable fiscal policies continue to support domestic demand, especially in rural areas, while public spending on infrastructure has increased. Trade volumes have expanded and investment flows into the country remain robust. As in most other emerging economies, rising inflation has become the biggest risk, though the country’s central bank has tightened its monetary policy faster than its counterparts elsewhere. The stellar economic performance notwithstanding, the country needs to do a lot more to ensure even basic living standards for a large section of its citizens. India is ranked 134 among 182 nations on the UN Human Development Index. Nearly a fourth of its population of over 1.1 billion still lives in poverty and almost a third is illiterate. Life expectancy is lower than most developing countries and children in the economically backward regions are malnourished. The healthcare and education systems, which are still mostly under government control and management, are ill-equipped and underfunded to cope with the demand. However, there are signs of progress. Federal budget allocations for education, healthcare and other social spending have significantly increased in recent years. A federally funded program to provide free lunch in schools has resulted in higher student attendance, and also addresses the problem of undernourishment among children. The Sarva Shiksha Abhiyan or Education for All program, financially supported by the World Bank, has improved primary education facilities across the country. The recently introduced Right to Education Act has made education an entitlement guaranteed by the government. The new law also has the world’s largest school voucher program, which will give students from poor families access to even private schools. The widely read and much hyped Goldman Sachs report – Dreaming With BRICs: The Path to 2050 – predicted that India has the potential to surpass Japan to become the third largest economy after the U.S. and China by 2032. During this relatively short period, the average income levels of Indians will also likely grow several times. While there are many caveats attached to this pace of growth, the projections which appeared improbable even when the report was published are now well accepted as possible. Uniquely among the major emerging economies, India will see continued population growth throughout the next five decades. This is an opportunity and a challenge at the same time, and the country’s long-term economic future will be determined by the way it approaches this issue. If the economic opportunities fail to satisfy the aspirations of this large population, the social, economic and political repercussions could be disastrous. For a more prosperous future, the country cannot fail to leverage the demographic advantage of its young workforce, when the population in most other large economies is aging. For a nation and its people who have deep faith in destiny, the stars are now aligned perfectly to herald a future full of prosperity. It is now left to the people of this ancient land and their leaders to reestablish their rightful place in the world.